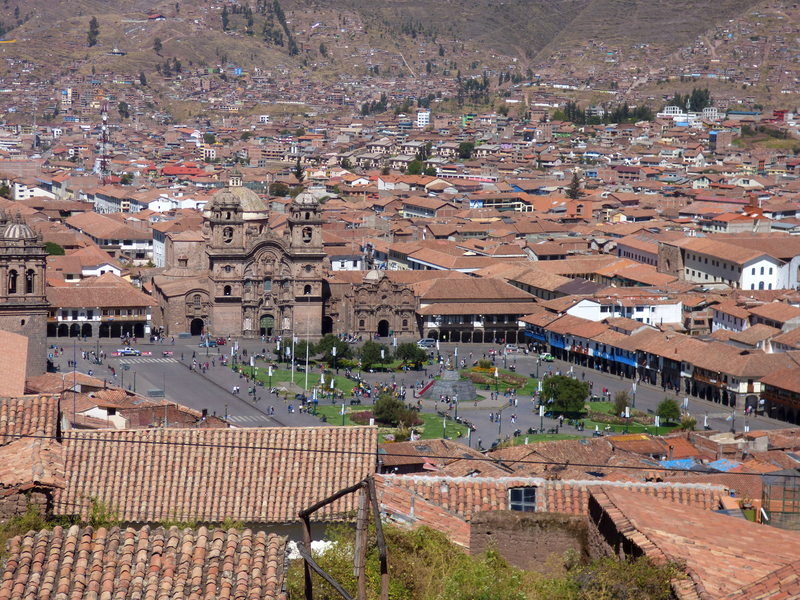 Cusco was an incredible city with a fascinating history. We stayed for 3 days to set up our trek to Machu Picchu and had a little extra time to explore the city. Before our actual trek, we had a few days as well, giving us some great memories during two very different months. Our first trip was at the end of June. We took a walking tour of the city and learned not only about the local hot spots and sights, but about the history as well. Fun fact: each of the 13 churches in Cusco were built on top of the inca temples that the Spanish destroyed. The Spanish ruined the religious sites of the incas and then built their churches on top of said sights, replacing the religion (in their eyes). What that created and shows up as today is an array of towering, giant churches with stones at their base that differ from the rest. The stones at the base of the churches are part of the original inca walls and architecture. The difference is incredible between the two. The snake in the wall… can you spot it? 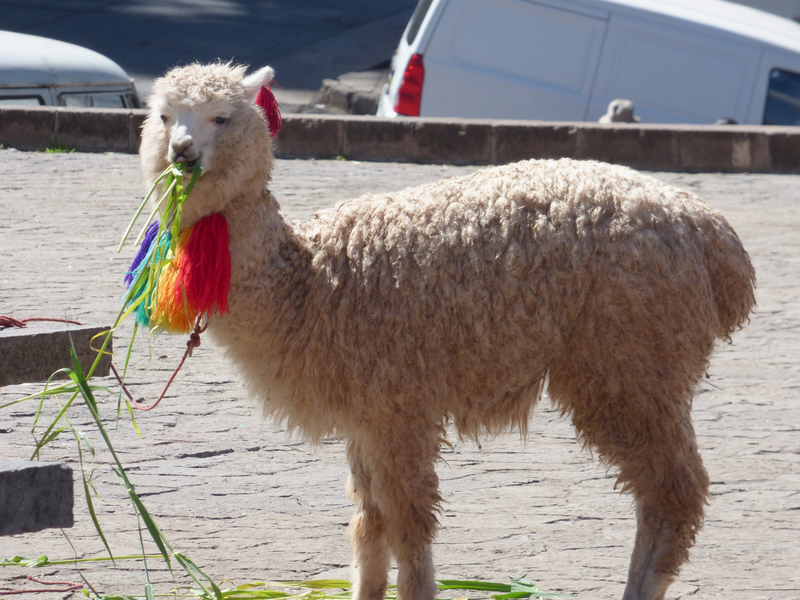 The only things in Cusco that are outnumbered by people are the llamas. They are everywhere! 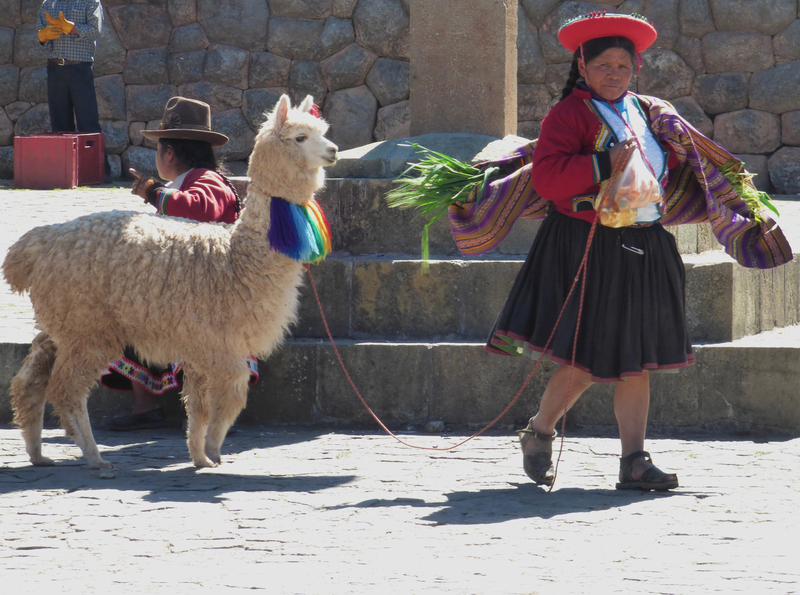 Because everyone, myself included, thinks they are so damn cute, the little Peruvian ladies walk around with their decorated llamas and baby goats. Whenever people want a picture, they are charged anywhere from 1 Sol to 5 Soles, depending on the location in town. Now, I have already stated that I won’t pay for a picture of a llama when I can walk to a field and take them for free. So, I never got a picture with the llamas. I did however, sneak around a corner and snap a few quick pictures of an especially cute one… Guilty. I couldn’t help it! The lady was all dressed up and on a mission to pimp out her llama! She was also trying to charge us 5 Soles for a photo. That’s just stealing! Aside from the llamas running around all decorated, there were llama sweaters and llama gear galore! There is a large central market full of food and shops, but the better prices are in the side streets surrounding the main square. One of these shops is where Chase and I got our matching llama sweaters… Yes ladies and gentleman, the answer is always yes to matching llama sweaters! From Ugly Sweater Parties at Christmas to cozy nights by the fire, we are set for life with these sweaters. 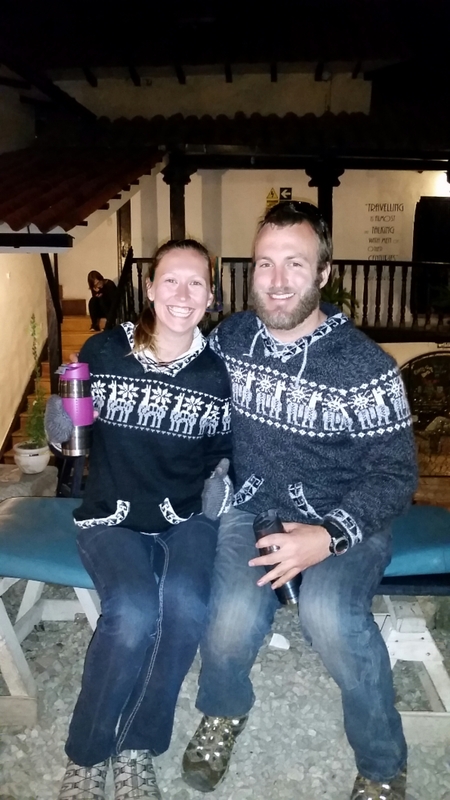 We even have a Machu Picchu photo in those sweaters for Christmas cards! To say I am thrilled to have a llama get-up including hat, sweater, mittens, and socks is a total understatement… I just love llamas. I doubt my family would be surprised if I brought one home! When we were in town the second time with Chase’s family, we explored the central market further. It was large and packed! The front third is comprised of little booths full of hand made items such as sweaters, socks, hats, purses, and other trinkets. In the middle, there is a large food section full of fresh fruits, veggies, and meats. Lastly, the back is full of booths that serve meals, varying from dinner to drinks to snacks on the run. The fact that so many things are fit into such tight spaces and still perfectly functional is amazing! It was some great food, too! 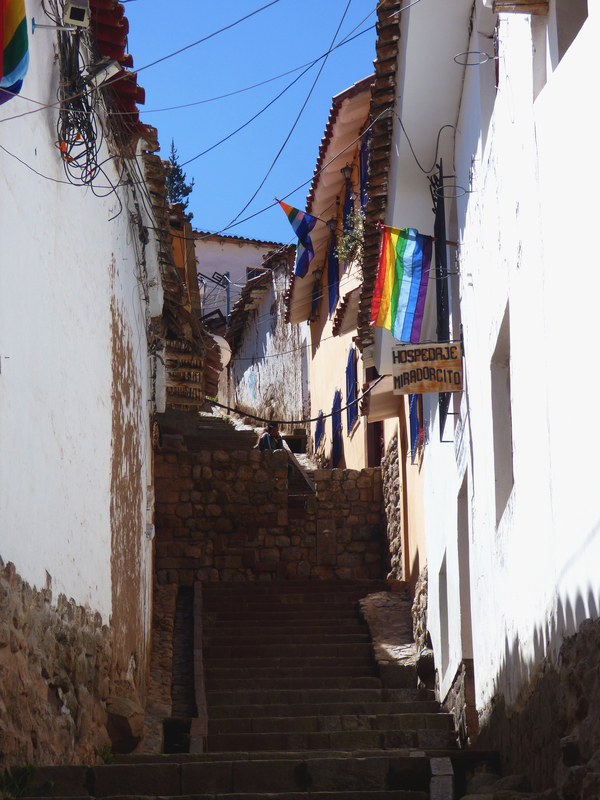 An average side street in Cusco, with part road, part stairs. Also, Cusco’s regional flag! The Andes lie right over Cusco. 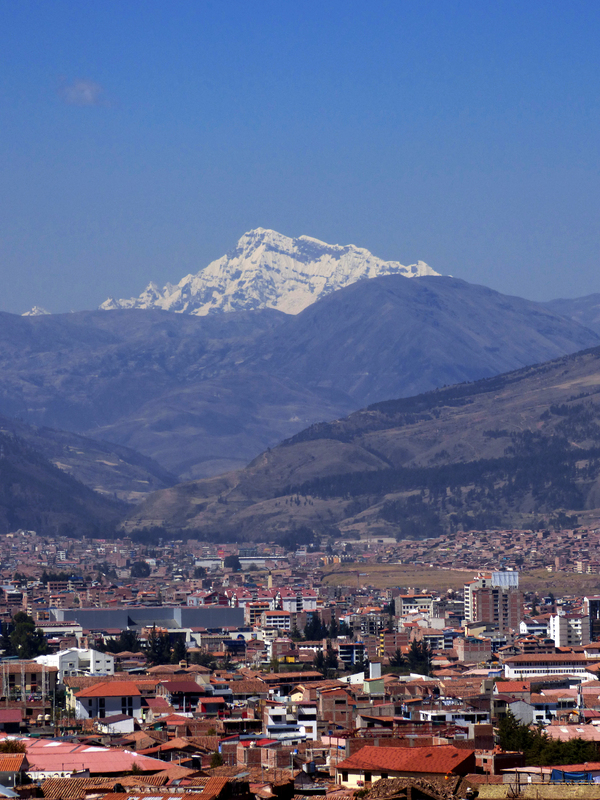 Cusco itself is at 12,000 feet in elevation. Cusco from above. It stretches out instead of up… and is much larger than I expected! After our trek, we had one day left in Cusco before the drive back to Lima. Luckily for us, it was independence day for Peru! There were people everywhere, tons of street food, and firecrackers going off by 7 am in the morning! Every person from the surrounding towns came in for the day to celebrate. It was a bluebird day with the smells of delicious street food surrounding us. Chase and I also got to bring his parents to Juanito’s, a local sandwich restaurant that another couple showed us on our first trip. It was AMAZING, and even better than the first time! To this day, it is still the best food I have had in Peru. With a happier heart and a happier stomach, my last day in Cusco was a grand success! Once again, Sweetheart, incredibly well written. I saved your last three posts to sit and read all at once. I found particularly intriguing the part about the Spanish destroying the Incan churches and building their own on top, leaving only the foundations — theoretically, no church building = no religion. It got me thinking about Christianity (definition – given over to and follower of Jesus Christ, our Lord and Savior who willingly died a horrific death on the cross for our sins and rose on the third day that we might be reconciled to God). The results would be different if the buildings today were all gone and the single foundation, Jesus Christ, was what everyone built upon . . . It reminded me of Ephesians chapter 4, specifically 4:4-6 where it says, “There is one body, and one Spirit, even as ye are called in one hope of your calling; One Lord, one faith, one baptism, One God and Father of all, who is above all, and through all, and in you all.” That pretty much spells it out. “The Church” in my humble opinion, has never been defined by a building or denomination. The Church is defined by the foundation, in our case, Jesus Christ. The churches described in the New Testament were not defined by their buildings, but rather by the brethren (body of believers in that town or city) and the geographical location. The church of the Ephesians above was the body of believers located in Ephesus — not a building. The same with the Corinthians in Corinth, the Galatians in Galatia, the Philippians in Philippi, etc. All the believers I’ve mentioned and more, together even though in different geographical locations, combine to make up The Body of Christ — Christians — THE CHURCH. Buildings have been destroyed for centuries, but the Chief Corner Stone of the church of which I speak and those who make up its entirety, although they always have and always will try, cannot be destroyed and in fact, nothing foreign to that can be built upon that foundation. But rather, as Ephesians 4:15-16 says, “Instead, speaking the truth in love, we will grow to become in every respect the mature body of him who is the head, that is, Christ. From him the whole body, joined and held together by every supporting ligament, grows and builds itself up in love, as each part does its work.” Didn’t mean to go on a rant, but it got me thinking about how we tend to lose sight of the eternal when we focus on the temporal. That is to say, when we walk by sight rather than walking by faith . . . Just sayin’ . . .